Quick! Open up google maps and google the following address: 334 Massachusetts Ave in Boston. According to an email I got recently, this is going to be the site of Red Mango - coming sometime this fall. Red Mango, one of the most popular and fastest-growing retailers of authentic nonfat frozen yogurt, has signed its youngest franchisee, 22-year old recent Babson College graduate Tarang Gosalia. 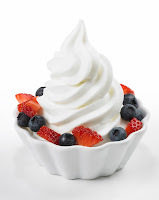 Gosalia plans to open his first Red Mango later this year at 334 Massachusetts Avenue in downtown Boston. I had previously posted about another deal to bring Red Mango to the city (here) but Tarang emailed me to let me know that his will actually be the first store in Boston. I suppose the good news is that it looks like it'll be near the Symphony T stop (for good accessibility) but bad news is that it appears we have one more summer to endure sans Red Mango or Pinkberry. 2 Response to "Red Mango Coming to Back Bay"